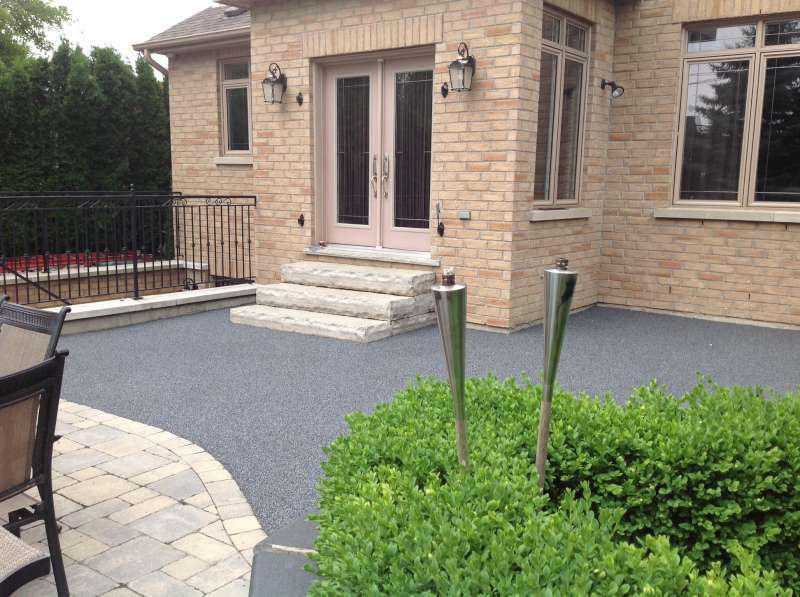 Details: A custom look and feel was wanted for this newly renovated house in North York. 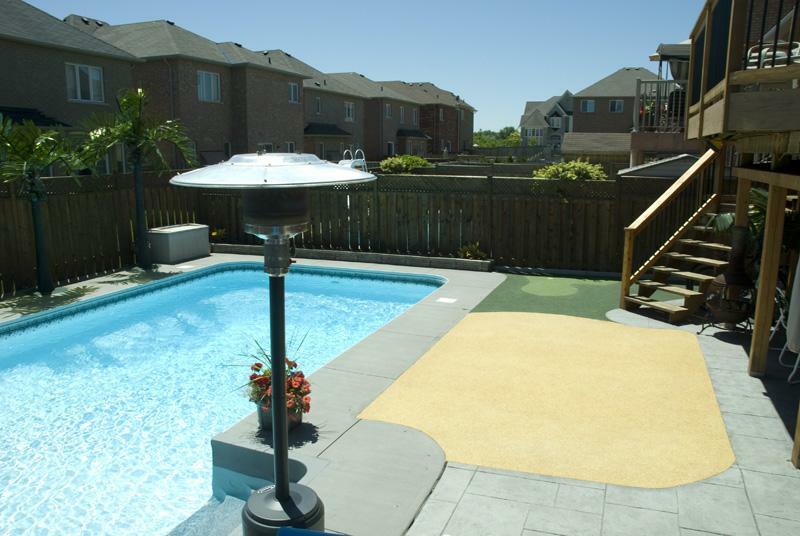 A family with kids and an active social schedule required a safe and attractive surface to complete the design of their backyard area. 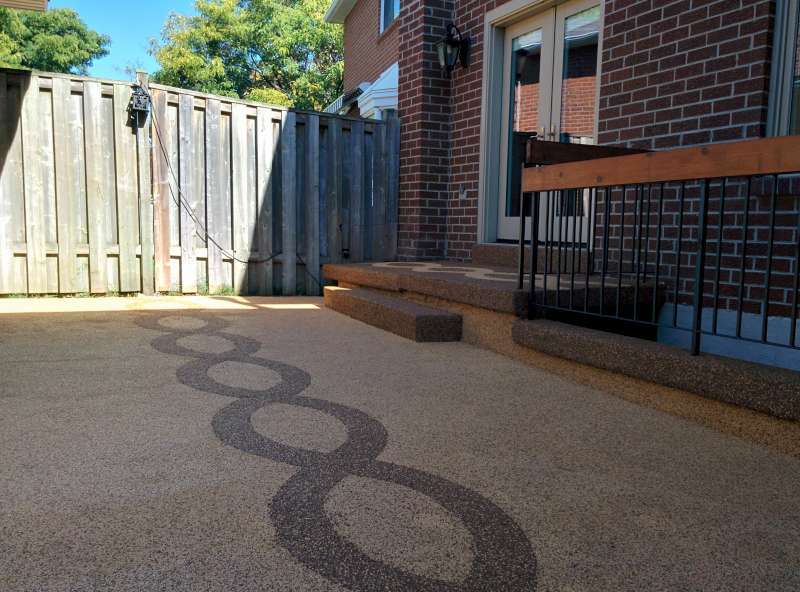 Details: An ant problem combined with older interlocking bricks lead to a backyard makeover for this couple. 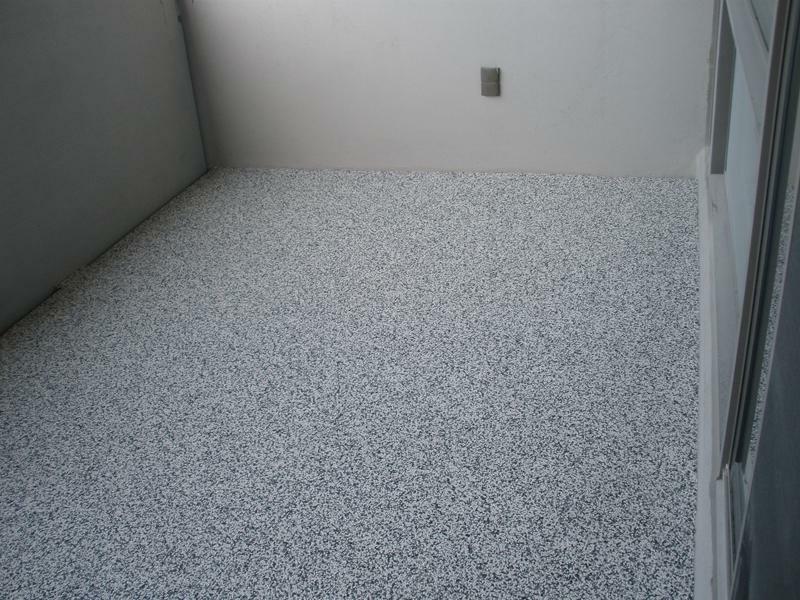 The surface was sealed using a polyurethane primer to lock the bricks together and prevent future shifting and movement. 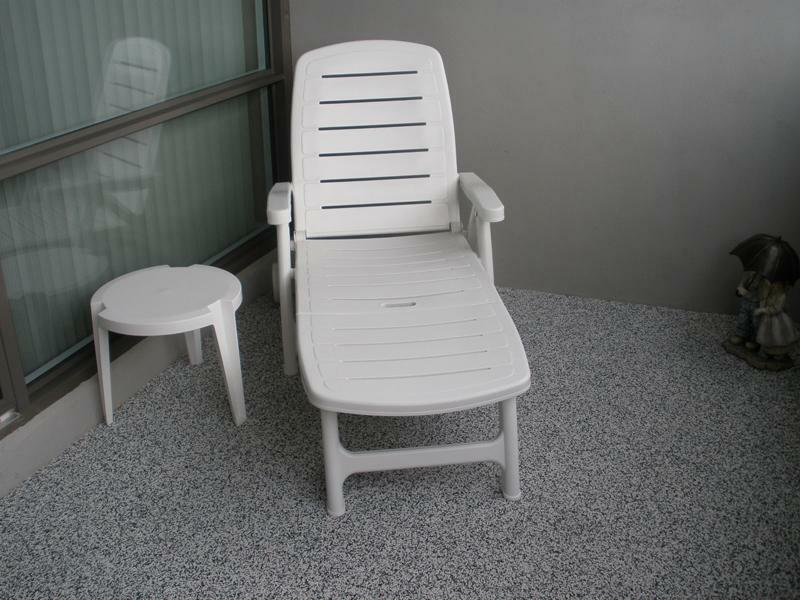 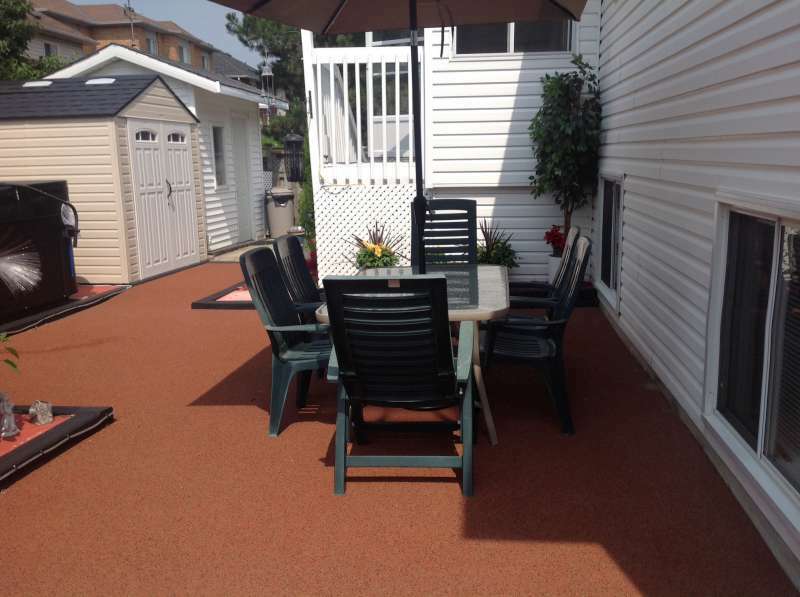 The area was then resurfaced to create a safe, seamless, and comfortable area to use and enjoy. 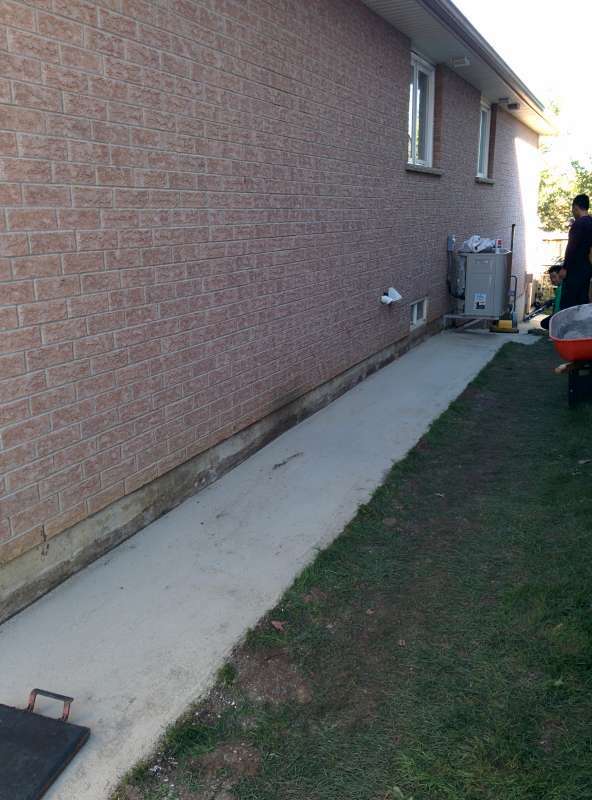 Details: The grass on the side of the house was removed and a solid aggregate base was created for structural support and proper drainage. 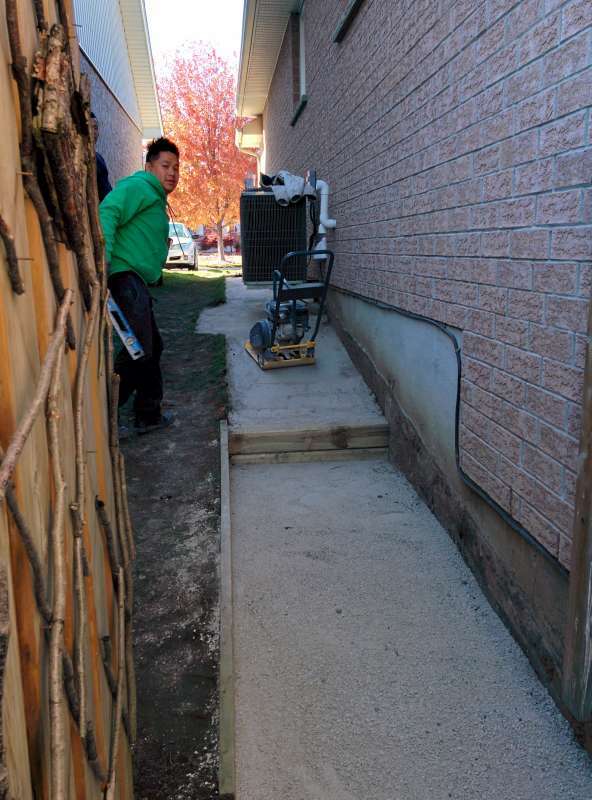 As well a retaining wall step was created to compensate for the 4 foot drop in elevation. 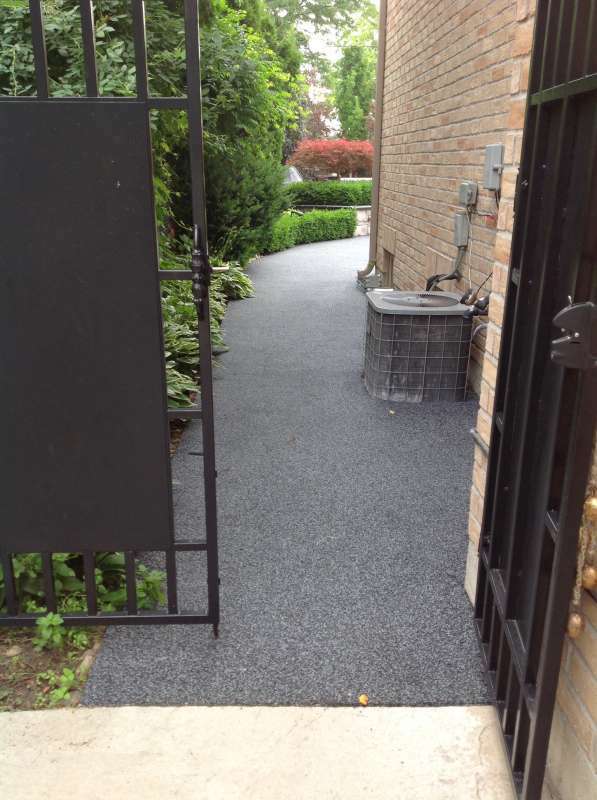 Next a layer of SBR rubber with an EPDM flake was applied to create a safe and non-slip walkway to the rear entry of the house. 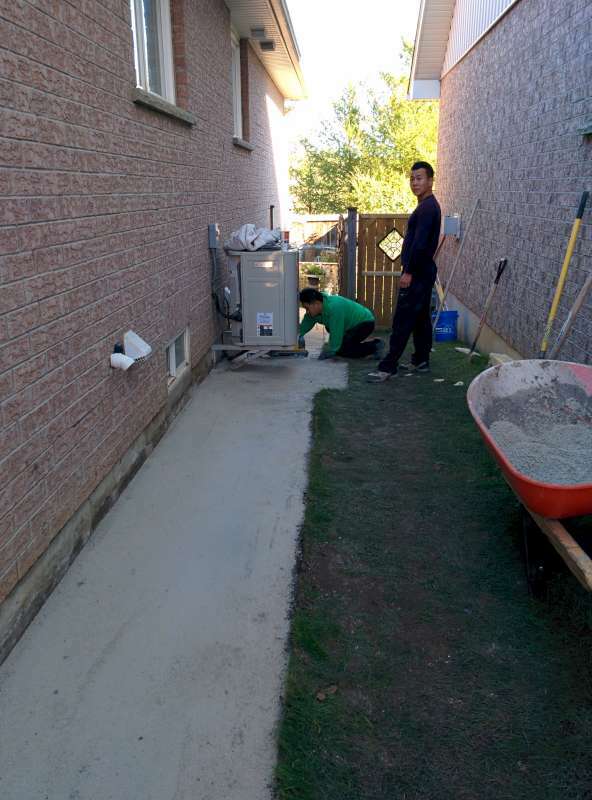 Details: Concrete slab back entry and poured concrete back patio. 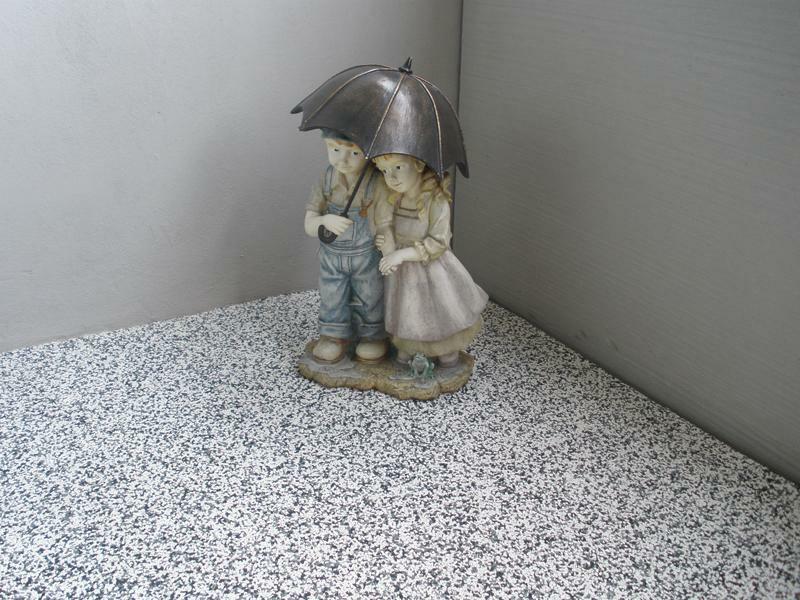 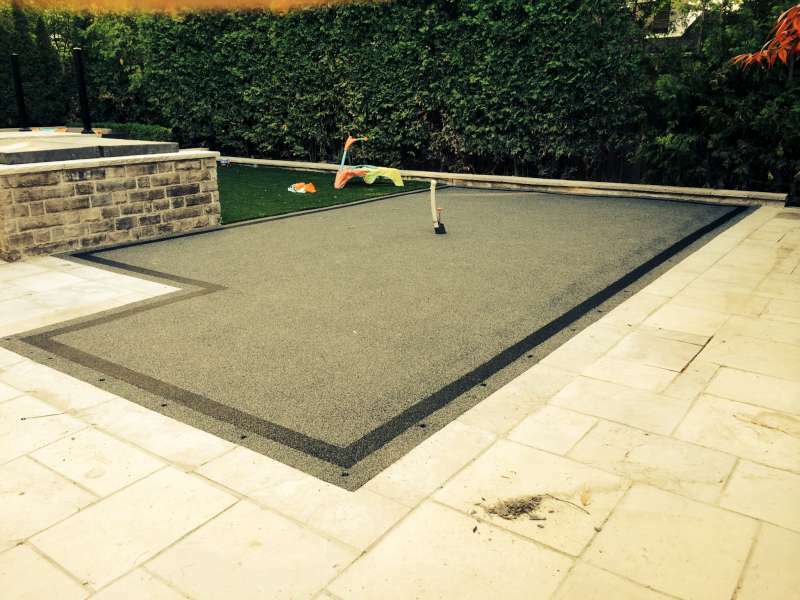 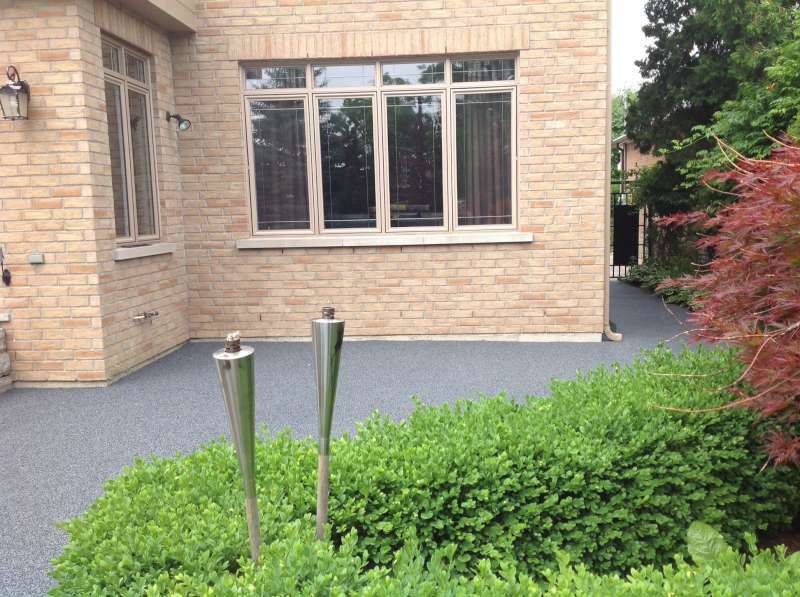 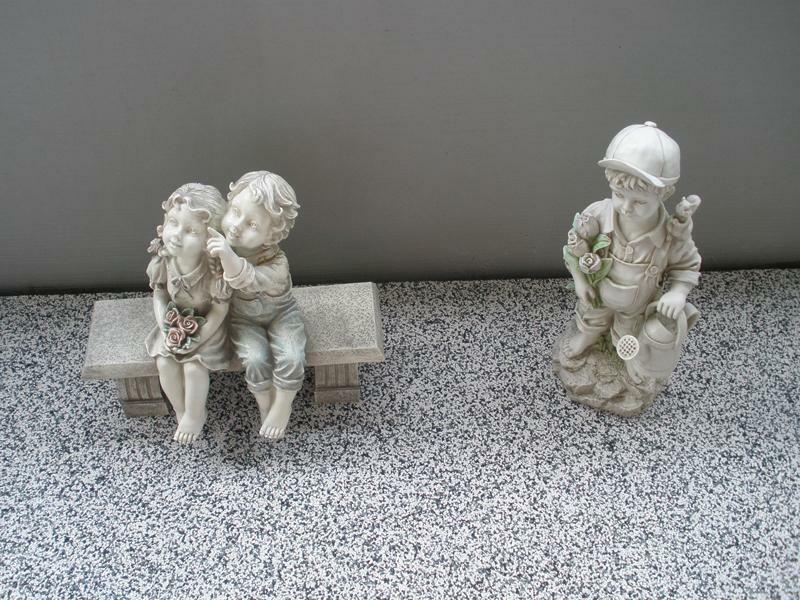 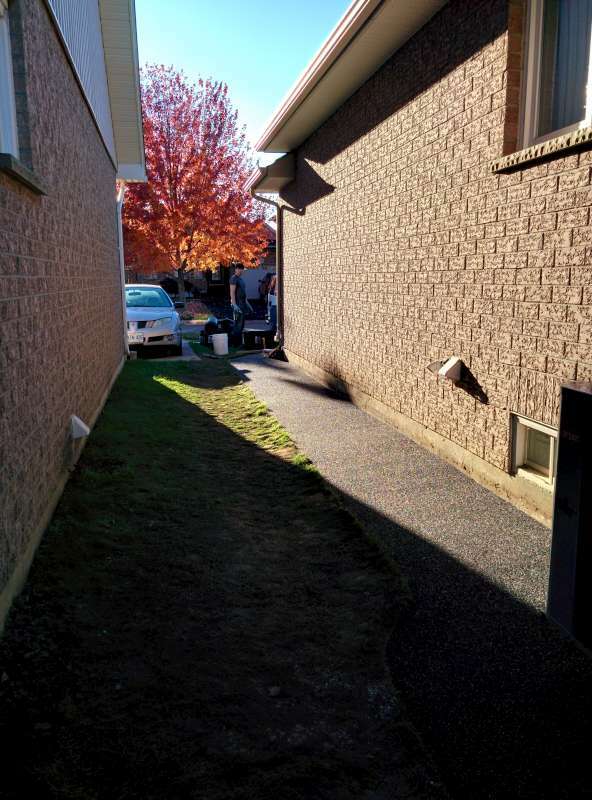 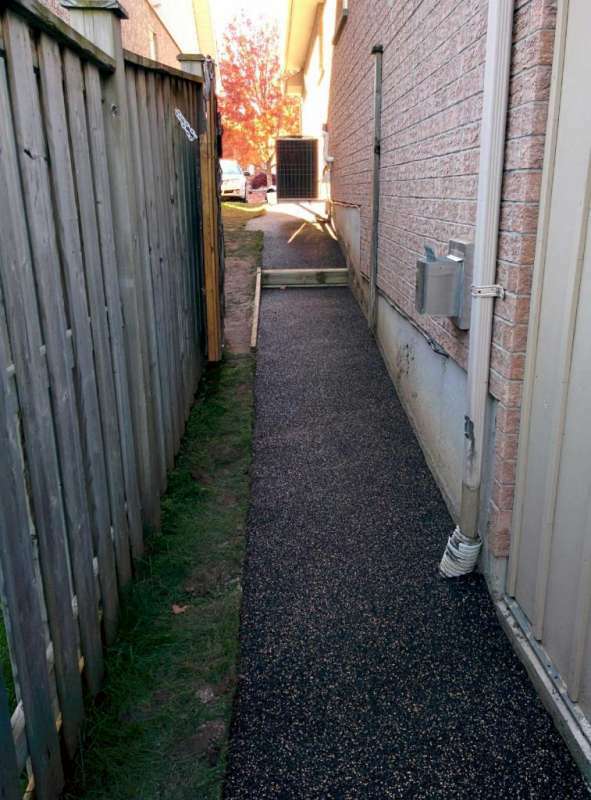 Both areas were resurfaced using EPDM rubber. 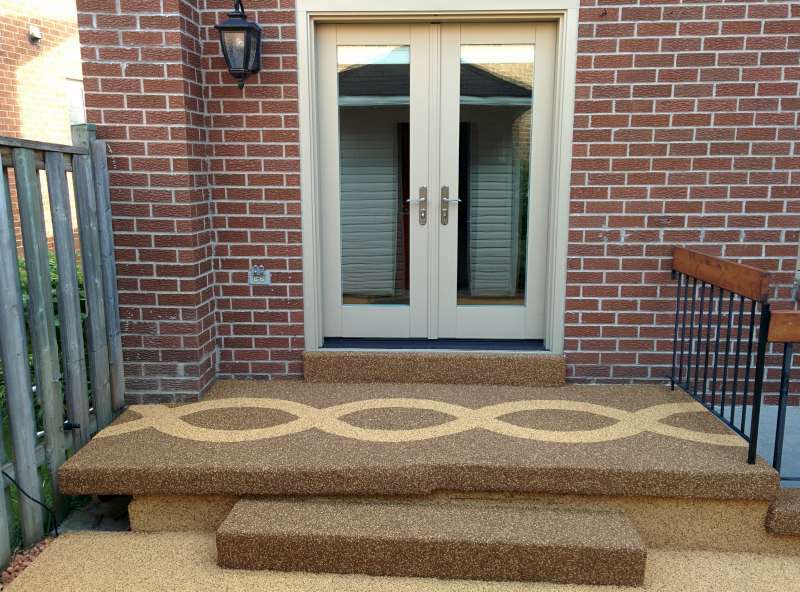 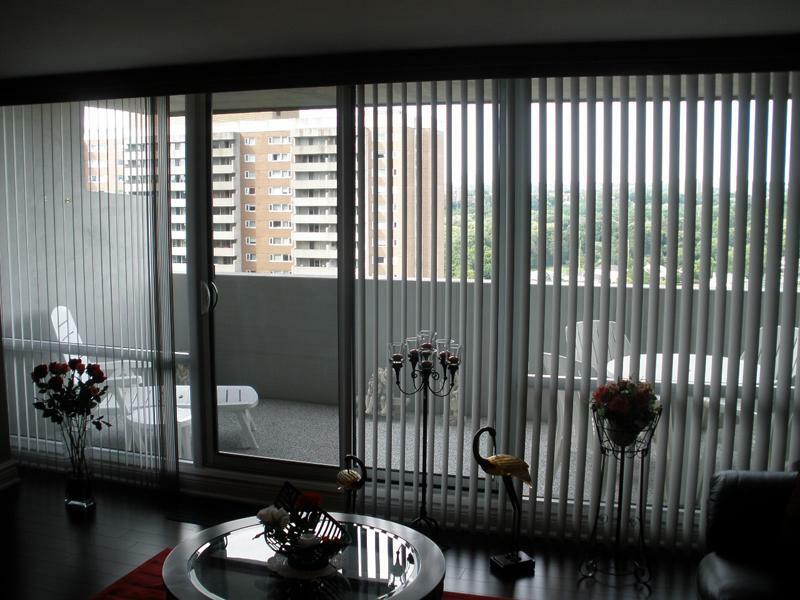 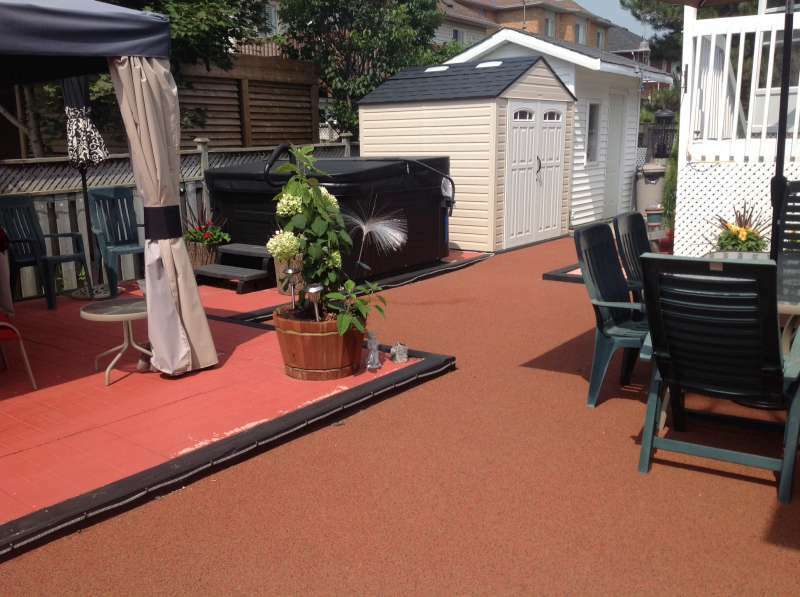 The top area was created with a brown base with a beige highlight, and the patio area was created with a Beige base with a brown highlight. 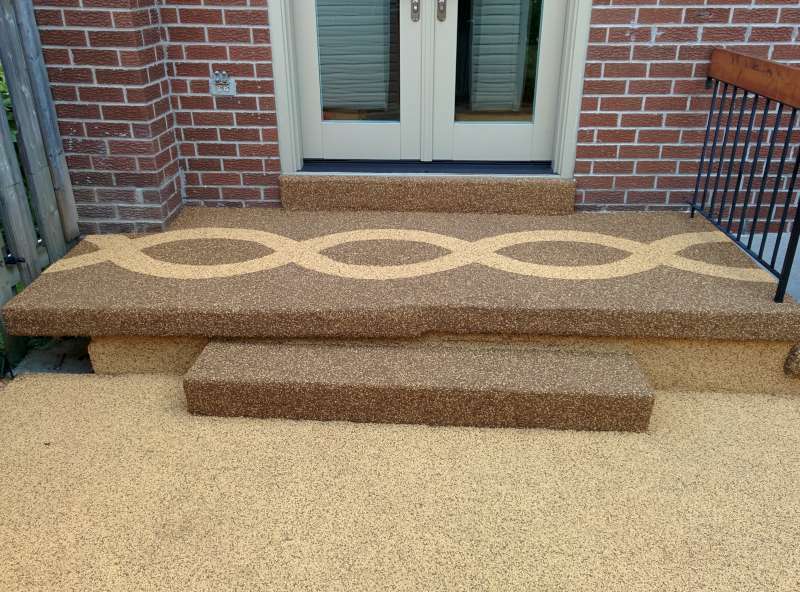 Next the double helix designs were inlayed to create the custom feel the clients were looking for. 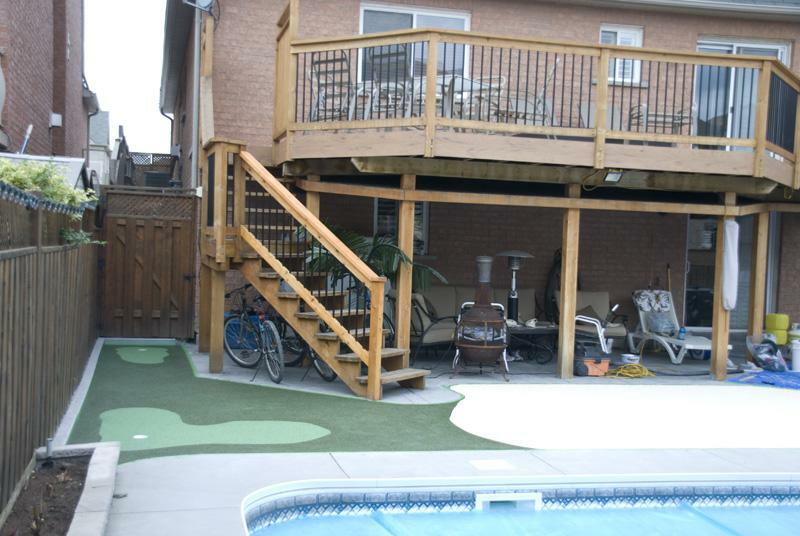 Details: A custom designed back yard play area was wanted for this fun loving couple and their kids. 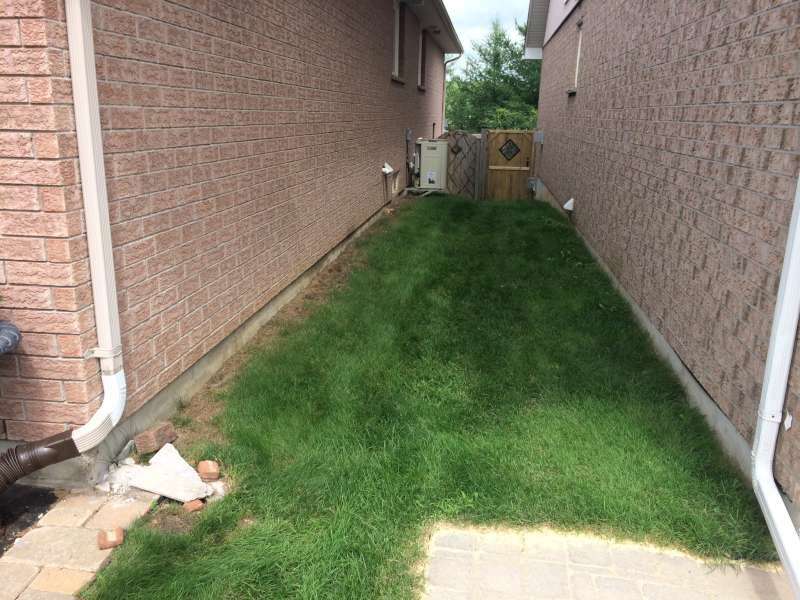 The area started as a grass patch that was very hard to maintain. 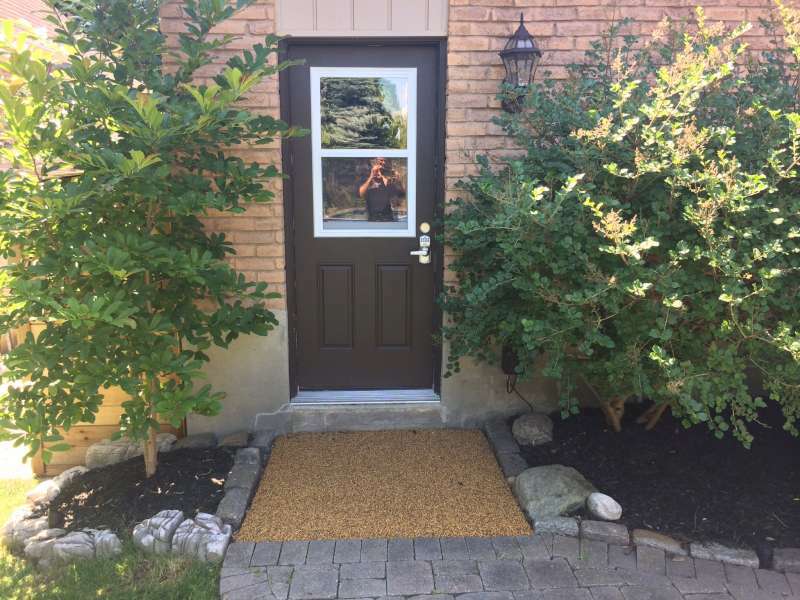 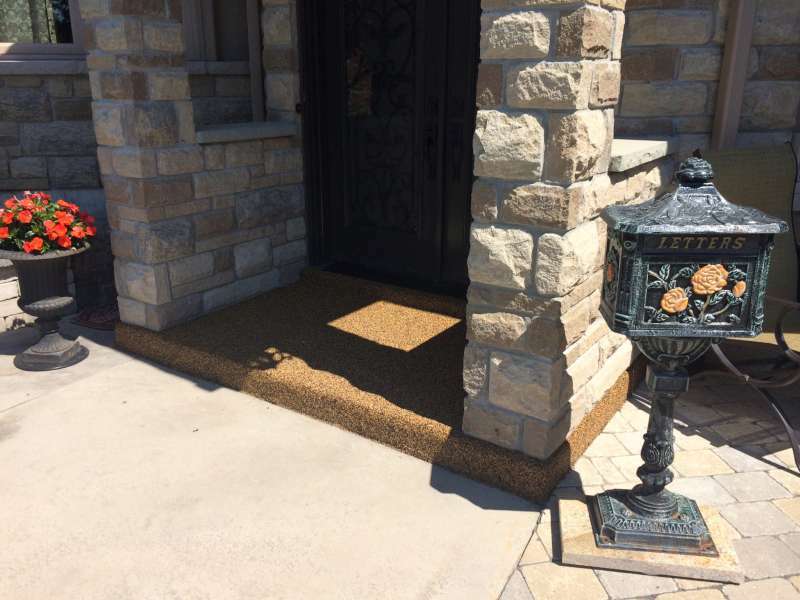 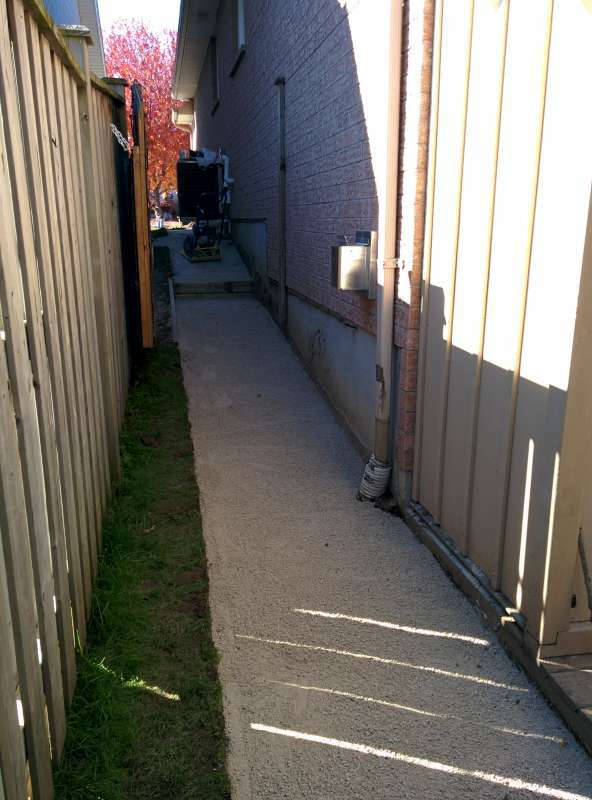 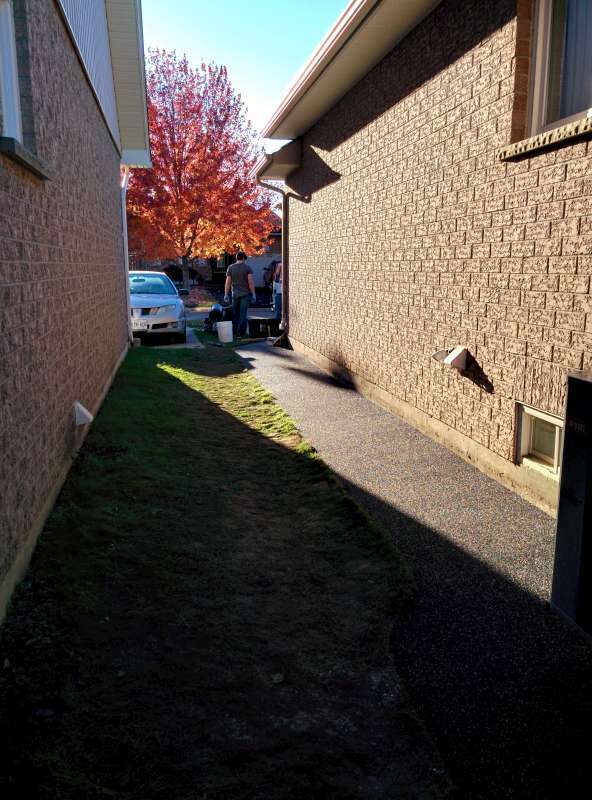 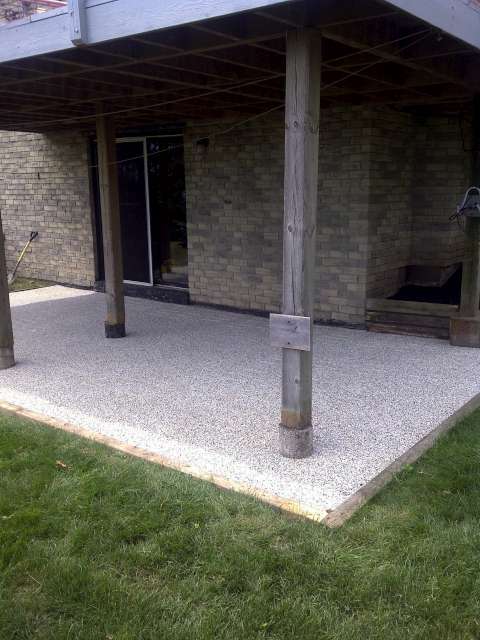 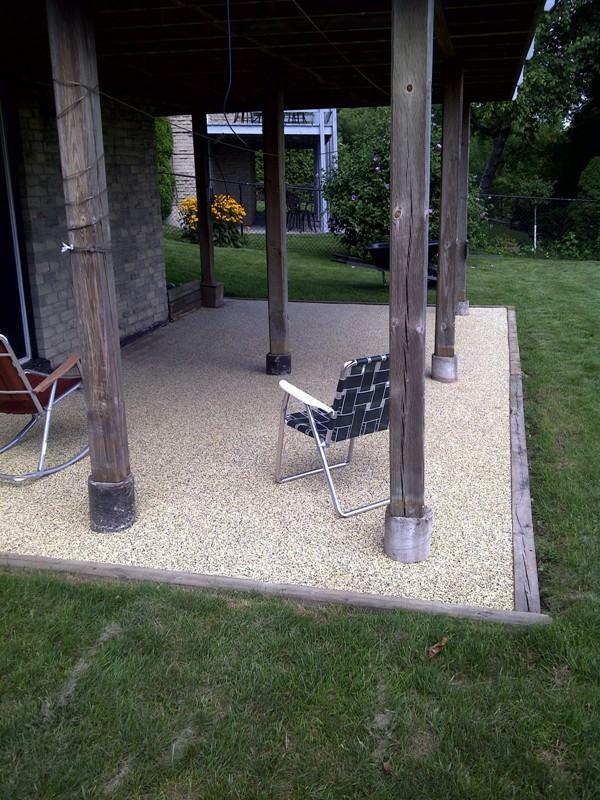 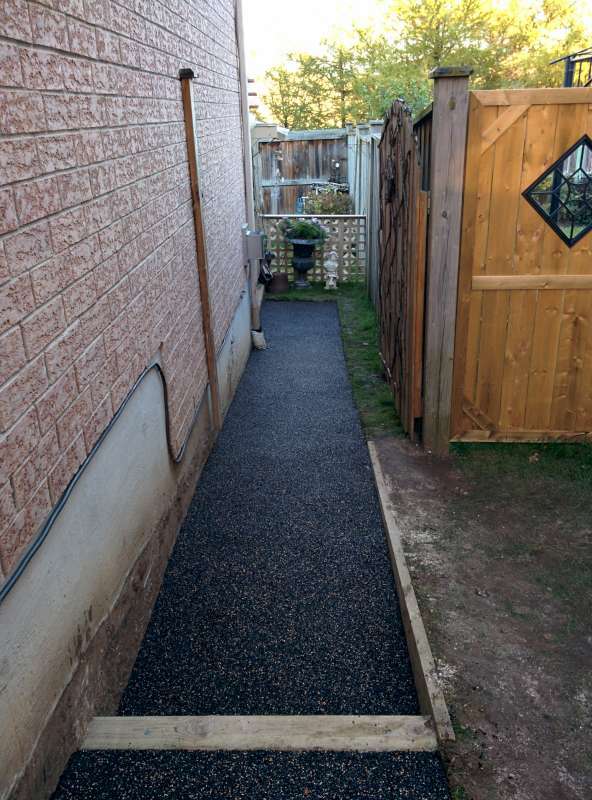 The grass was removed and a solid base of crushed aggregate was installed. 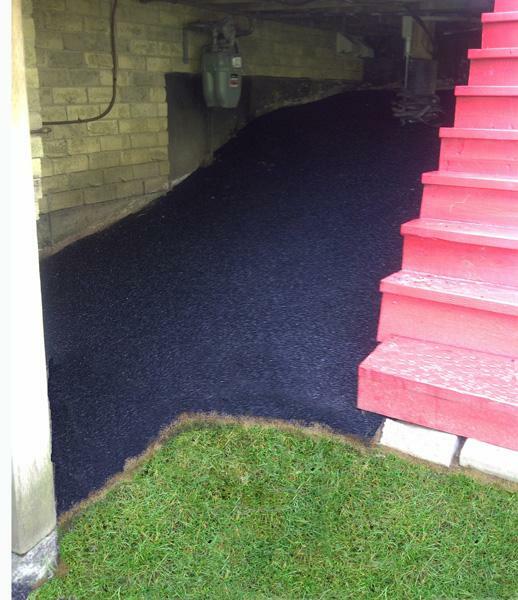 Next a layer of SBR rubber was used to create the hills and valleys of the mini putt course. 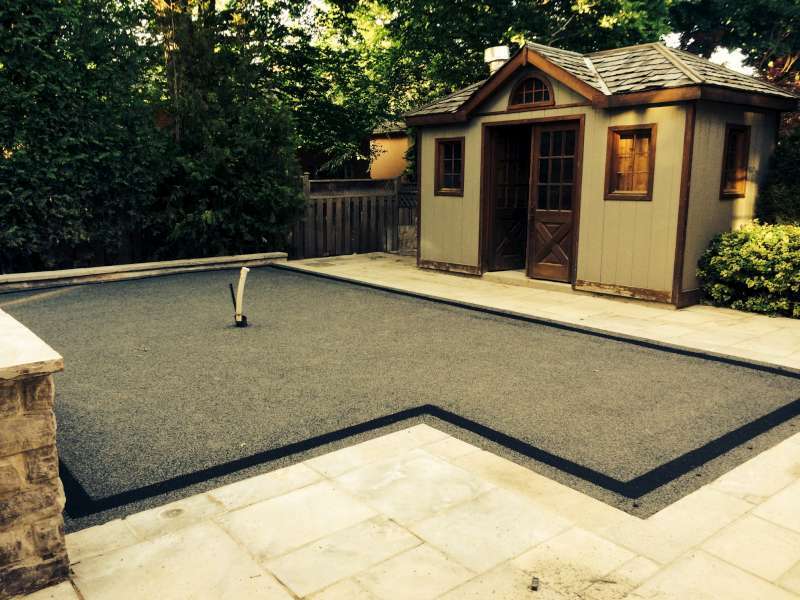 Last the EPDM coloured top coat was applied to create a custom designed putting green and fairway beside a sand coloured area to place the table tennis. 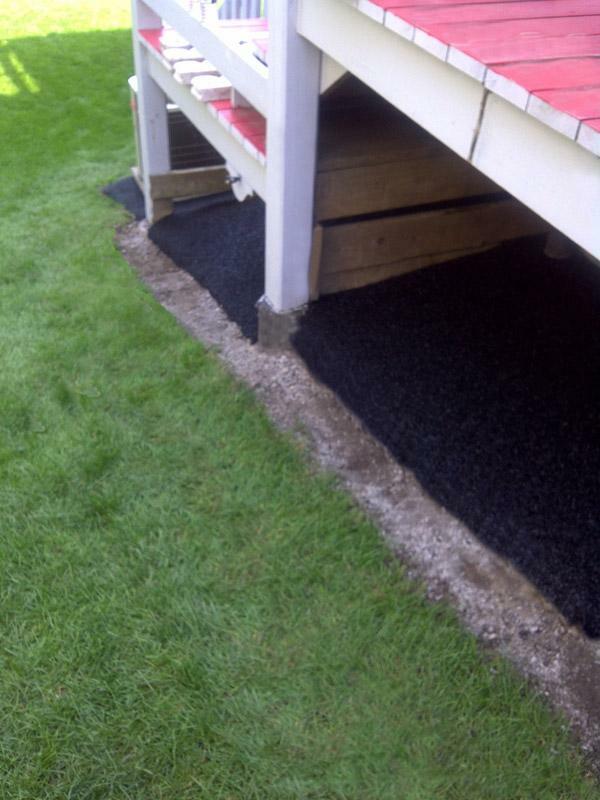 Details: Older interlocking surface with 4 x 4 wooden retaining edge. 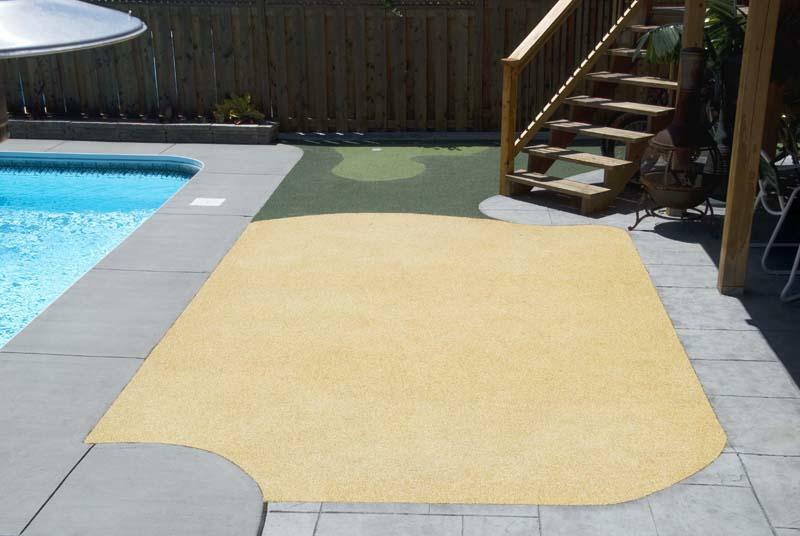 The interlocking surface had become un-level and overgrown with grass and weeds. 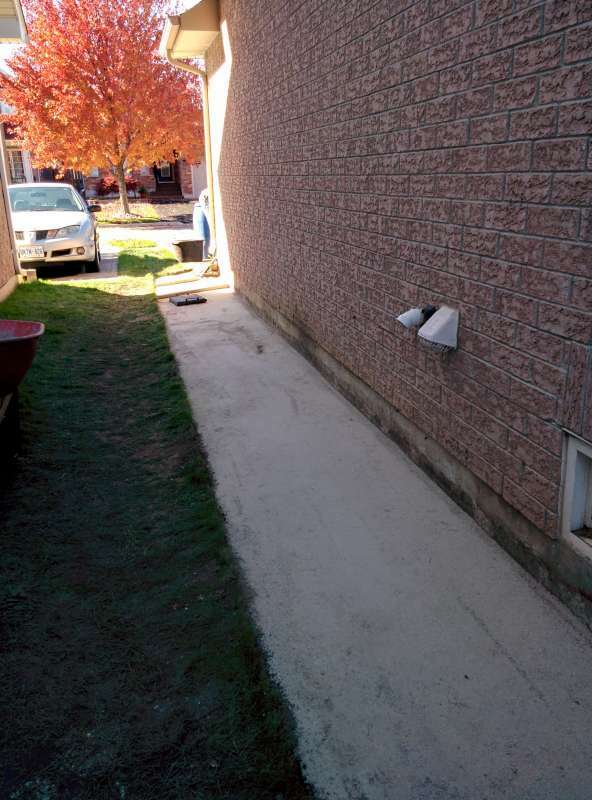 Weeds and grass were removed and the surface was sealed with a polyurethane primer to lock the bricks together and prevent future grass and weed growth. 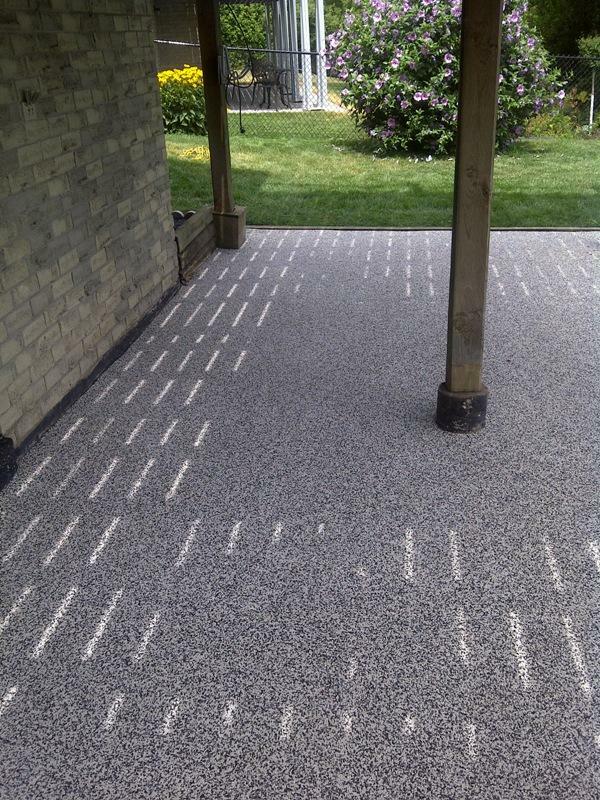 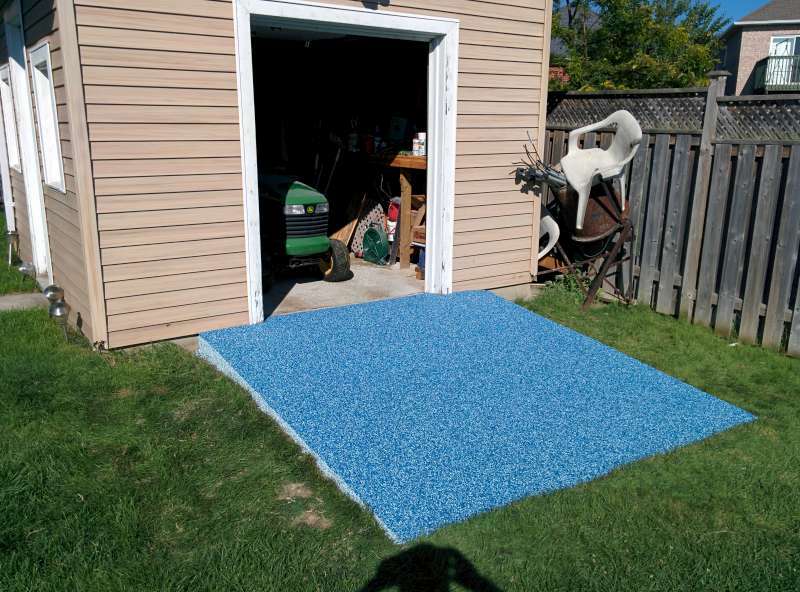 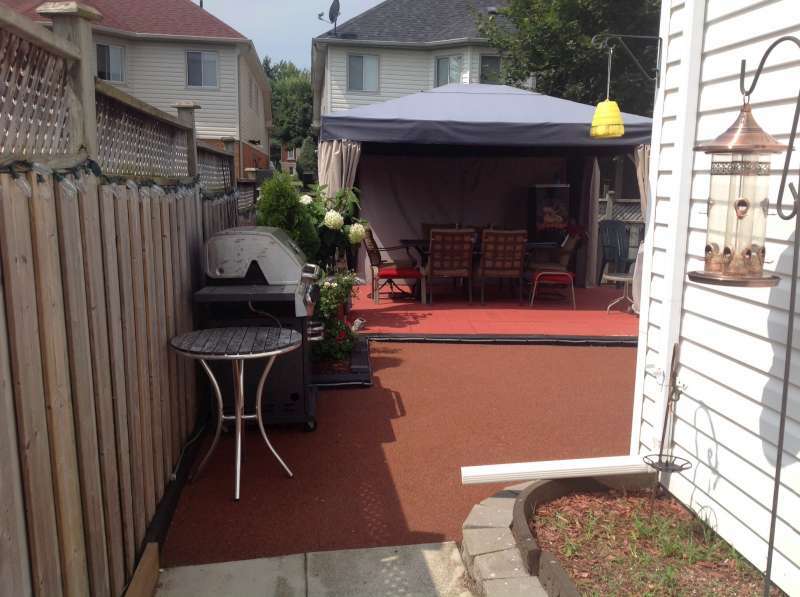 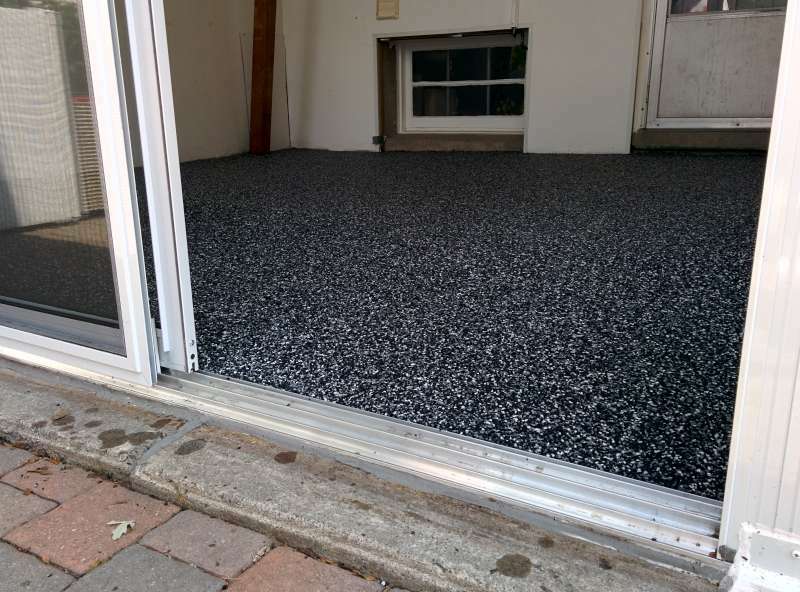 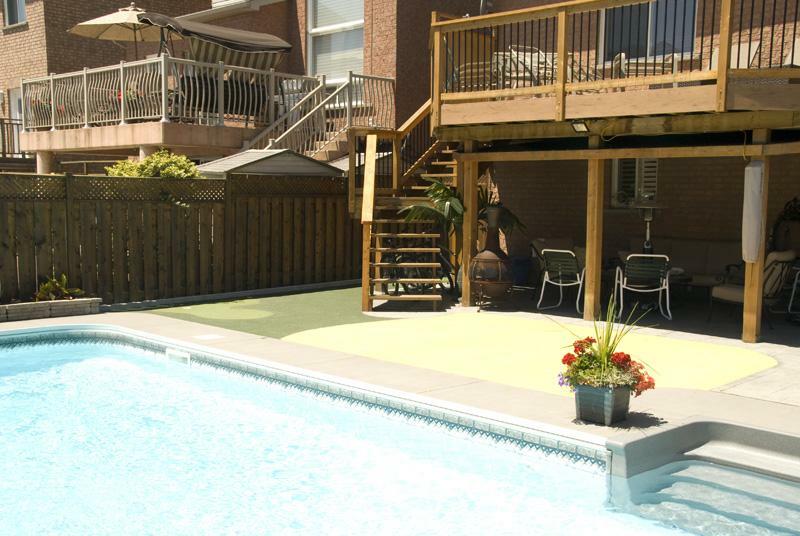 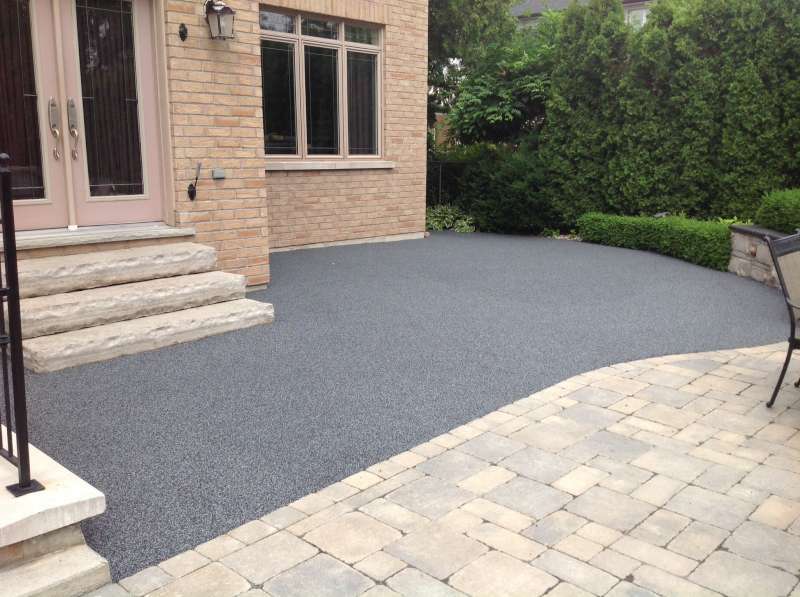 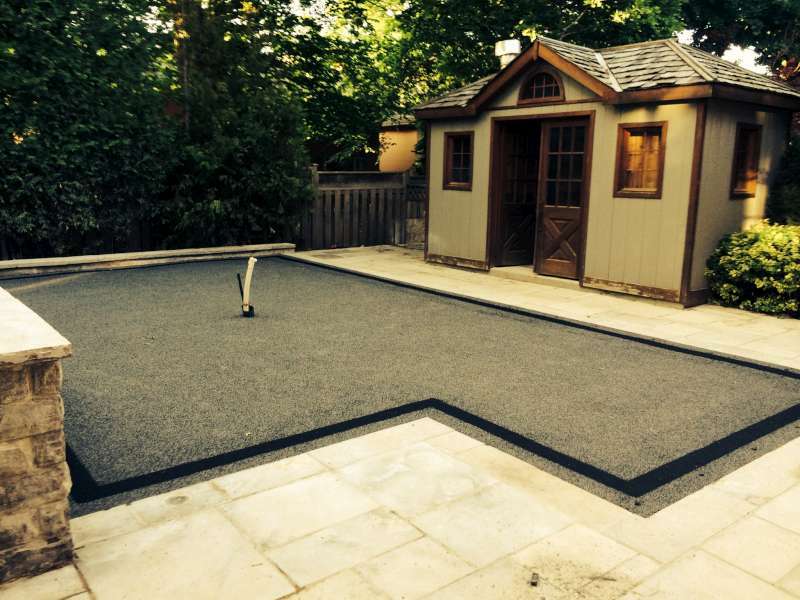 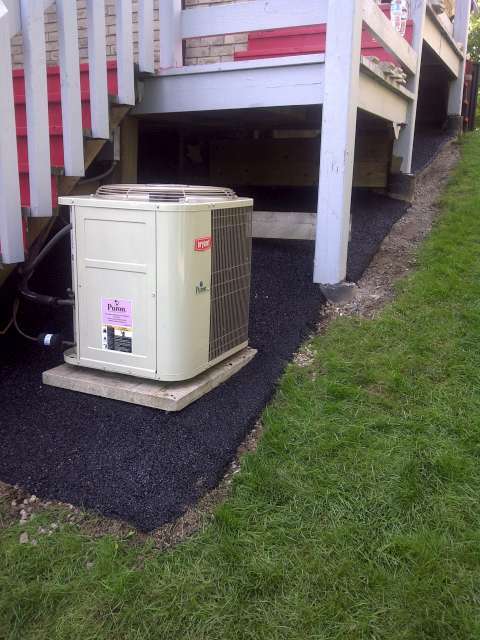 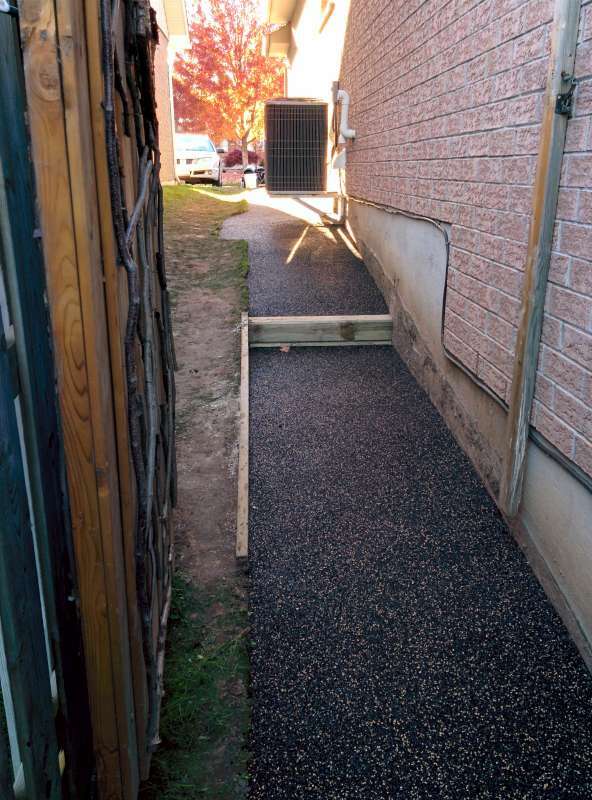 Then the area was resurfaced with EPDM rubber to create a safe, beautiful back yard patio. 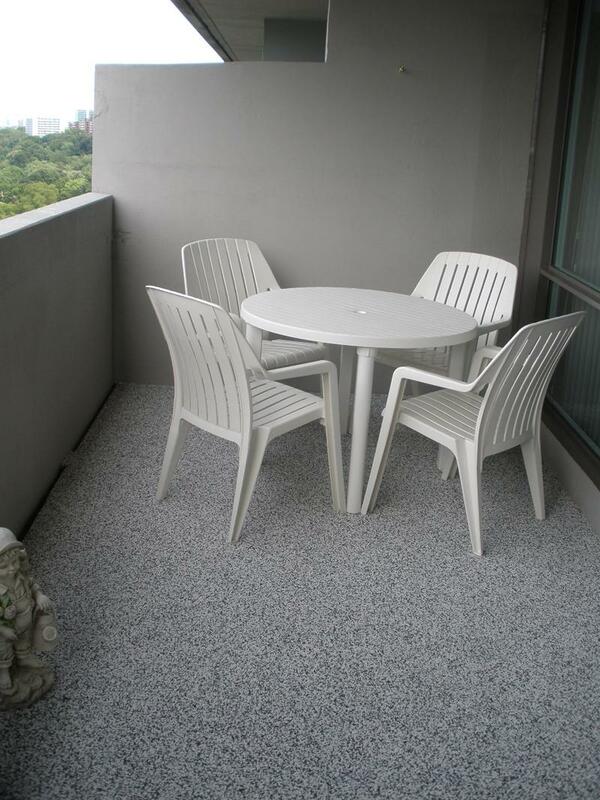 Details: Outdoor paint was removed from the concrete balcony and then sealed using polyurethane primer. 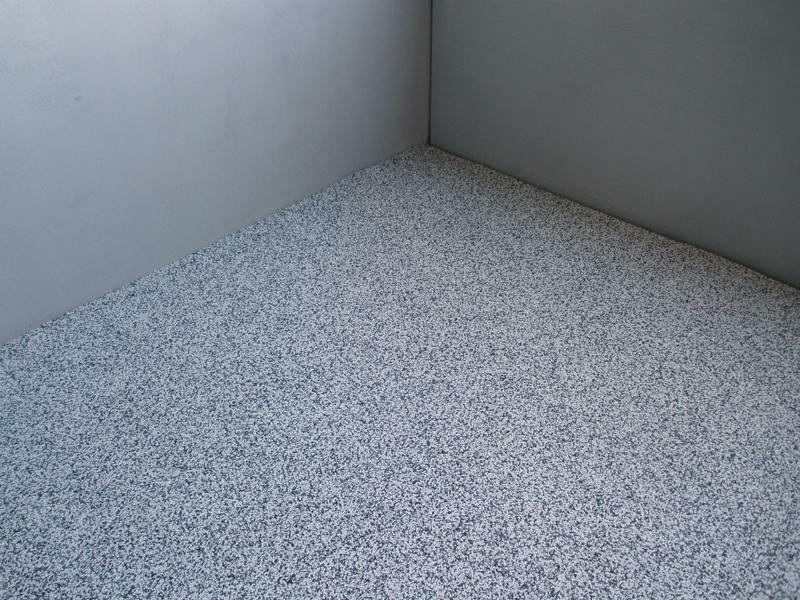 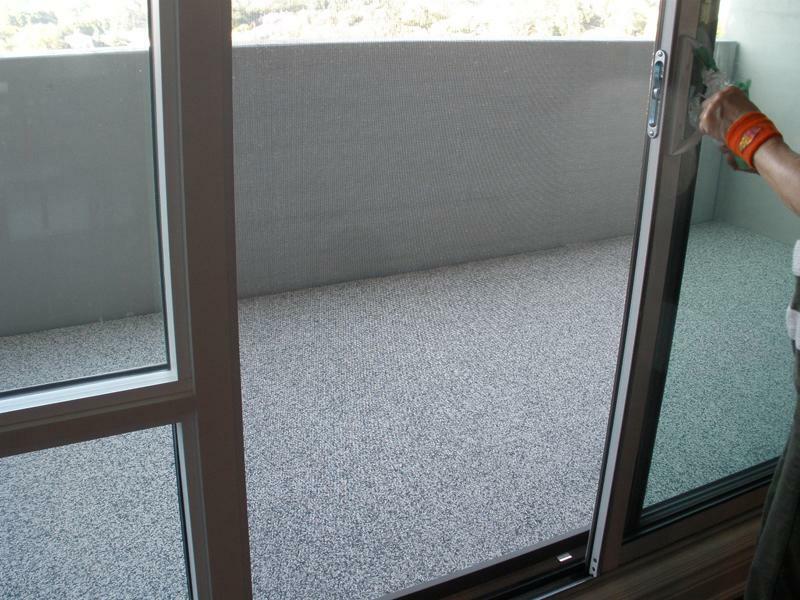 Then a beautiful surface was installed using white and grey EPDM rubber to create a long lasting and comfortable balcony surface. 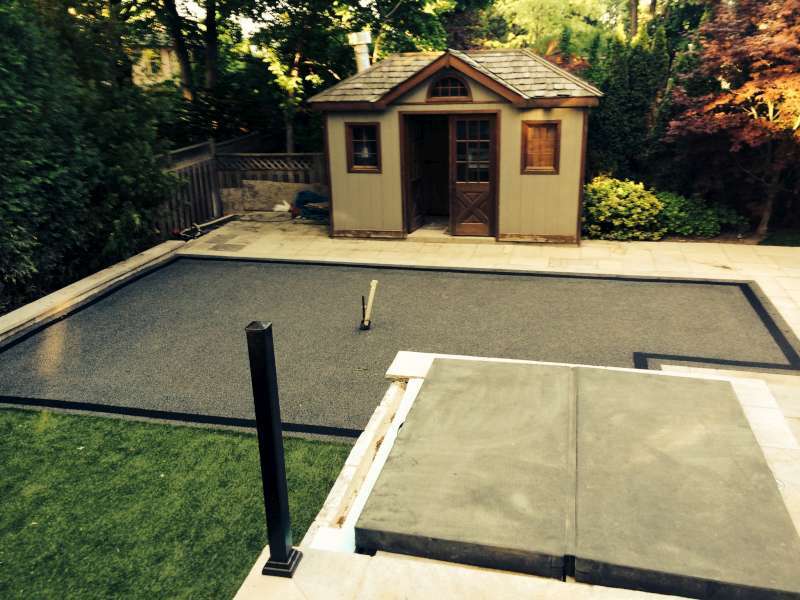 Details: A custom look and feel was wanted for this newly renovated house in North York. 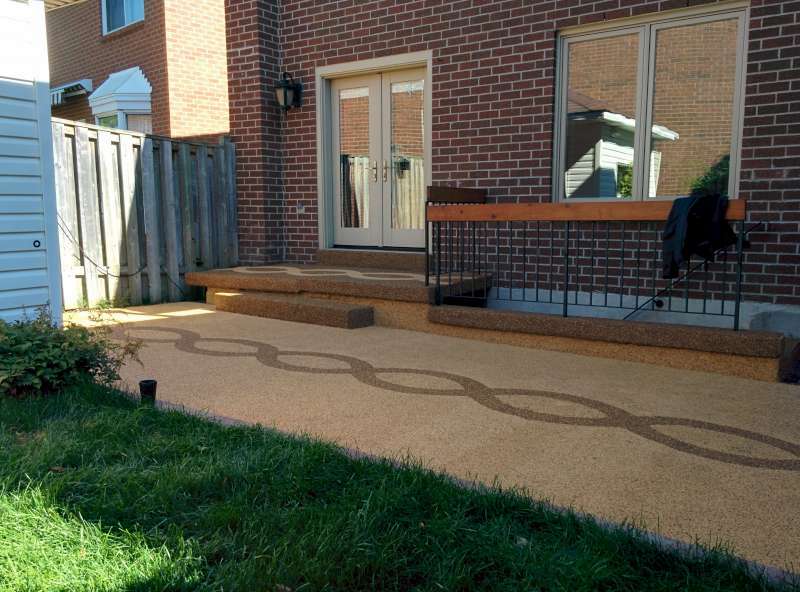 The family wanted a classic design to match their backyard landscaping while still being safer than interlocking for their children to play on. 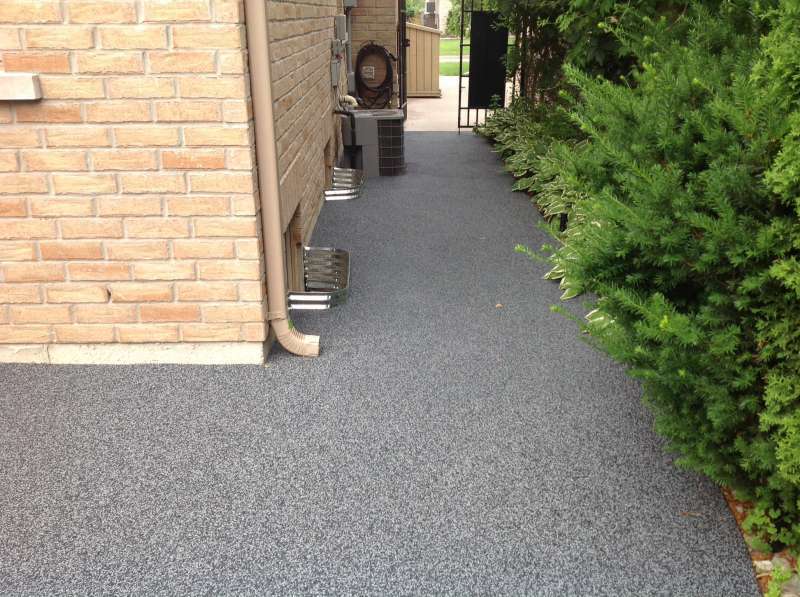 A two tone grey surface was installed and a picture frame boarder was inlaid in solid black. 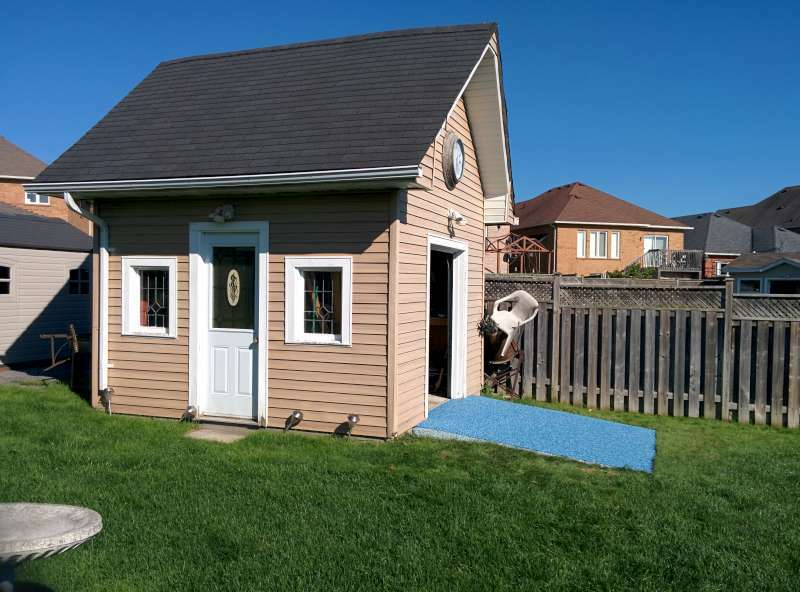 Details: More colour and personality was wanted to add to this customers backyard shed. 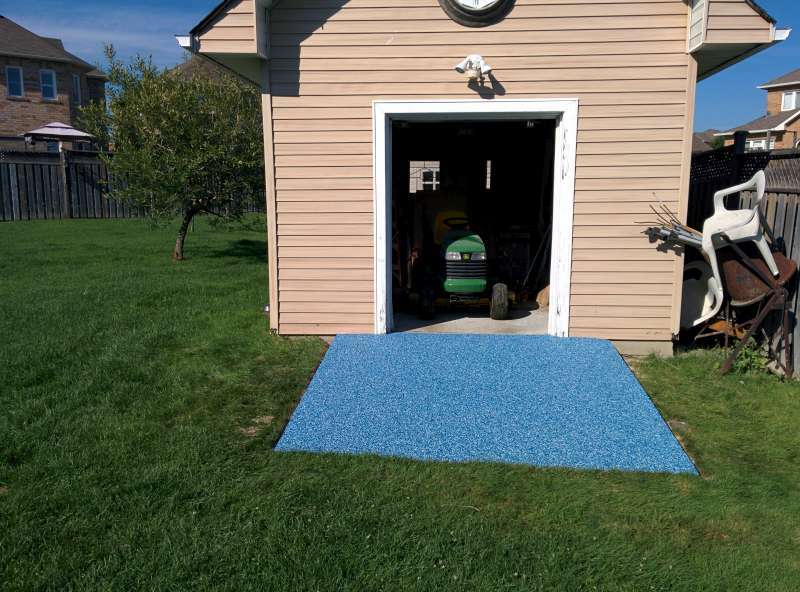 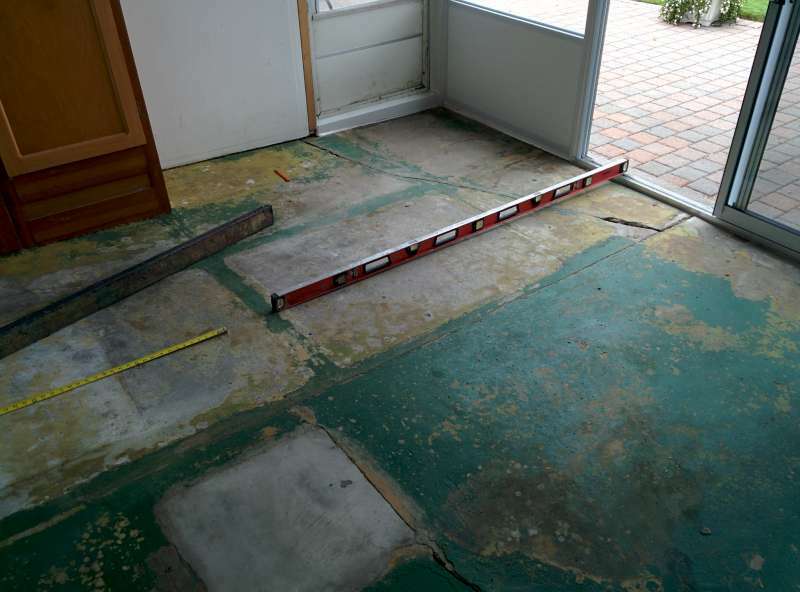 As well, non-slip safety was a high priority for all tools brought in and out of the shed.